Since its release in January 2011 ‘Little Lady’ (taken from Ed Sheeran’s ‘No.5 Collaborations Project’ EP’) has amassed 415 plays in my iTunes library, for good reason. That reason is Mikill Pane, one of the best and most refreshing artists currently emerging from the congested UK music scene with their debut album. Said album ‘Blame Miss Barclay’ is the culmination of years of work, during which Pane has gained thousands of dedicated fans, and chances are this album will bring in many more, and should, considering how good it is. The strongest aspect of Pane’s music for me has always been his storytelling prowess and ‘Blame Miss Barclay is no different. It’s one of the many areas in which he excels throughout, with Pane conjuring up a number of scenarios and telling the less serious ones with charm and tackling the more serious topics with maturity and in a thought provoking way. Perhaps the best example is ‘No-One Gets Left Behind’, a chilling song about a suicide pact between the two subjects, told from the perspective of one of them. It’s one of the more serious of the 15 songs that make up his debut and therefore it’s also one of the most affecting, addressing societies and the participants views. It ties in with the following track ‘Rooftops’, told from an outsider angle that briefly features the two subjects, expanding on the previous sombre song in a more lighthearted and uplifting way. Links like this are common throughout ‘Blame Miss Barclay’, making it an album that demands your full attention and rewards it with a different discovery each listen. Pane’s ability to put himself into another persons shoes and write coherently and emotionally is a true reflection of his talent and it’s a strength showcased across several songs on ‘Blame Miss Barclay’. There’s a poetry in songs like ‘Life On The Line’ and ‘Fade Away’ that Mike Skinner would be proud of, especially the latter, which sounds a lot like ‘The Streets’ in terms of sound. ‘You Don’t Know Me’ tackles racism, with a smart and funny last line that turns the song on its head. There’s a lot of smart comedy on ‘Blame Miss Barclay’ despite its occasionally macabre nature, and Pane shows his fun side on feel good singles ‘Good Feeling’, ‘Summer In The City’ and ‘Chairman Of The Bored’. They’re spaced out well between the songs that demand more thought and as a result ‘Blame Miss Barclay’ is a diverse album that shows Pane’s range whilst presenting a portrait of modern life, taking in the highs and lows. Pane’s flow brings life to his songs and ‘Blame Miss Barclay’ is excellent in that sense. Pane takes every opportunity to impress, from the frantic last verse on the albums opener to ‘The End’, a song about the end of a relationship, with Pane singing for the entire duration. Hip-hop purists will be well satisfied whilst those who prefer a more mature and forward thinking take on rap music will be equally pleased by the content on ‘Blame Miss Barclay’ and the way in which Pane delivers it. Subtle wordplay and humour is frequent, making ‘Blame Miss Barclay’ a very intelligent album that pairs excellent delivery with even better storytelling. There aren’t many artists who can use words as well as Pane, and his talent makes his debut equally compelling and entertaining. The production on ‘Blame Miss Barclay’ is exactly what it needs to be, merely serving as a canvas for Pane to paint over. There’s a good mix of sounds, from the guitar chords of the albums opener to the minute long intro that precedes ‘Lucky’, a hard hitting song that’s been floating around for a few years. There are a number of influences from outside the genre scattered throughout ‘Blame Miss Barclay’, meaning there really is something for everyone here with Pane borrowing from rock, reggae and R&B to name a few. I should touch on the deluxe edition version of the album I bought, which contains four extra tracks. The songs here are of a similar quality to the normal edition tracks, and includes old favourite of mine ‘Learning To Swim’, which has also been reworked and improved. Other tracks ‘Inside Man’ and ‘Reminisce’ are emotionally charged and affecting, dealing with racism and abortion, whilst closer ‘Old Man’ is a touching and heartfelt letter to Pane’s future self. I’d definitely recommend buying this version, if only for the heartwarming documentary about Pane’s (now Justin’s) search for the English teacher that inspired this modern hip-hop masterpiece. To conclude, ‘Blame Miss Barclay’ is a first class example of how to make an album that justifies a long wait. It’s deep, thought provoking, upbeat, exhilarating and hopefully it gets the acclaim and success it deserves, if only so that Miss Barclay gets her plaque. 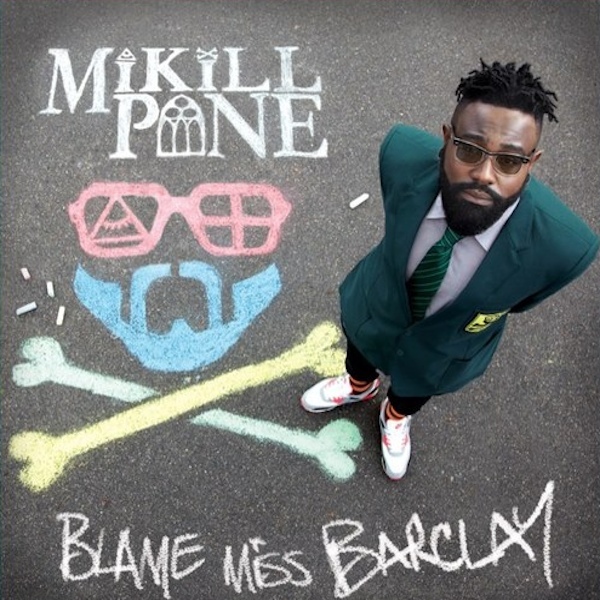 For me it’s easily the best hip-hop / rap album I’ve heard this year, and proof that Mikill Pane is definitely one of the best in his field, if not the best.